Saturday morning, we were anticipating a trip to the Camellia Grill, which Lori had proclaimed to have utterly perfect pancakes on our previous trip. I remembered reading a forum post on Roadfood that mentioned that the Camellia Grill had opened a second location in the French Quarter. This opened up a debate about location. Last year's trip through the Garden District to the Camellia Grill and back had made us too late to attend the World's Longest Oyster Po' Boy, and I didn't want to miss it again. 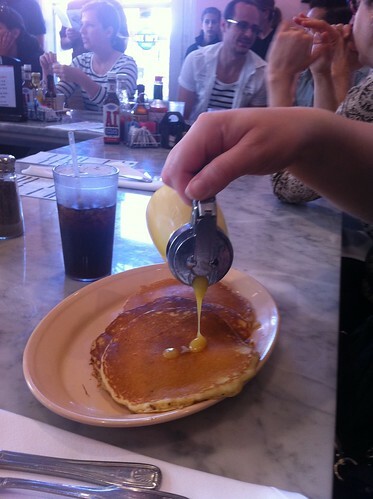 On the other hand, utterly perfect pancakes are not to be trifled with. The French Quarter location won out based on two arguments: (1) If we went to the French Quarter location, we would then know whether it measured up to the original, and (2) we could visit the original location on Sunday if the French Quarter location proved wanting. The outside did not have the stately Greek columns of the original. (The original has the most elegant exterior of any diner I've patronized.) Inside, though, it looked almost exactly the same. 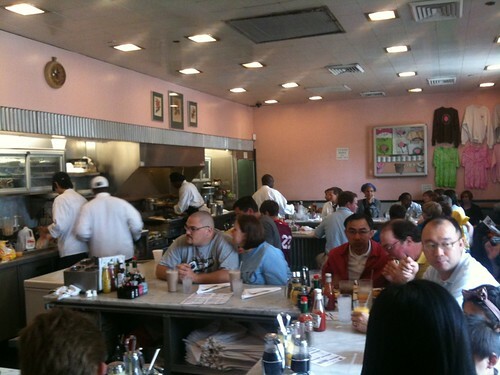 The two locations have the same W-shaped marble counters, the same pink walls, the same uniforms, and even the same banter between cookstaff and servers. 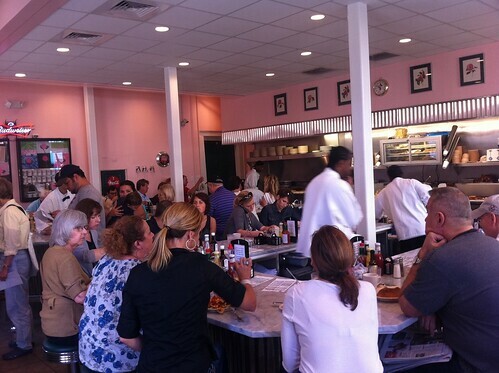 The first picture is a picture of the French Quarter location; the second picture is a picture of the interior of the Uptown location last year. I ordered the red beans and rice, because I had studied the Roadfood Festival flyer and seen that there would be no red beans and rice available at the Festival. The Camellia Grill offers its red beans and rice with a "hamburger or hot sausage patti" [sic]. 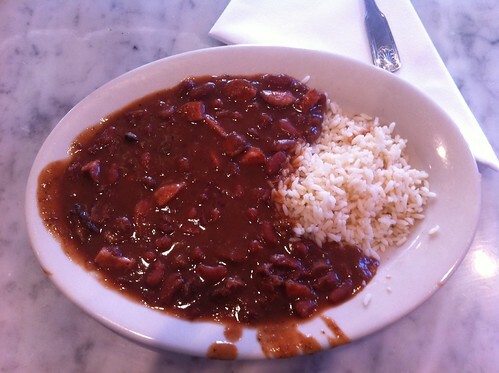 I chose the red beans and rice without; I wanted plenty of appetite for the festival ahead. I didn't miss the patti; there was lots of sausage in my dish. These red beans didn't have the rich, soulful depth of K-Joe's at the festival last year, but these were excellent in a different way, a clear tenor instead of a gravelly bass. Our judgment: the French Quarter location of the Camellia Grill is fully the equal of the Uptown location in all but outdoor columns.